MUGSHOT! MAKE YOUR OWN MUG! Learn how to make a cup or a mug from start to finish! You will learn three handbuilding techniques to form your cup. Learn to create the body, finish the foot, and add a handle. Additional techniques will include surface decoration. When finished, you will pick a glaze for your cup/mug. The cup will be glazed for you and fired and returned to you for you to enjoy! Turnaround time for you to receive your mug will be 3 to 5 weeks. I will explain more about this the evening of the event. LIMITED SEATING! Reserve your spot now! 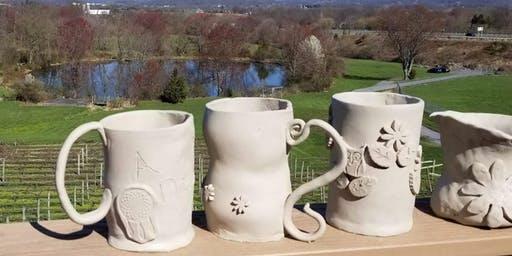 $35.00 includes clay, tools, glaze, firing, and 2 hours of instruction! Build a second cup for $10!